Skin is the organ (a group of different types of tissues) that covers the outside of the body. How many functions can you name? It excretes substances such as sweat which aid in thermoregulation, and sebum, an oily substance which is responsible for the development of acne. There are local specializations of skin to form skin appendages such as nails, hair, and glands. In addition to thermoregulation, the skin plays a role in sensation, protection from photodamage, and an immunologic function. There are also regional differences in the skin. Thick skin is found on the palms of hands and soles of feet, referred to as glabrous skin. The stratum corneum is very thick in these areas. Thin skin is found almost everywhere else on the body, particularly on the face and genital area. The "thick" or "thin" in this context refers to the thickness of the epidermis (the most superficial layer of the skin). 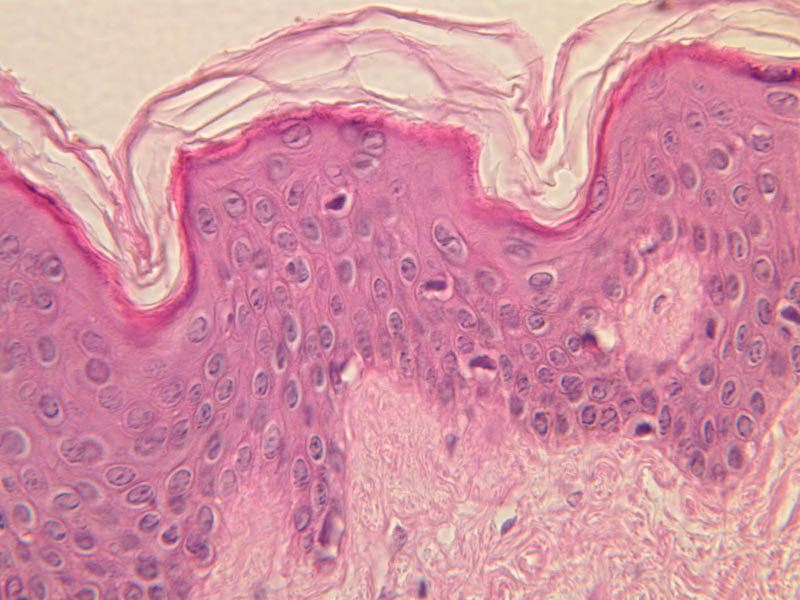 For general orientation, note that skin has two components, epidermis (a stratified squamous epithelium) and dermis (a connective tissue layer beneath the epidermis). 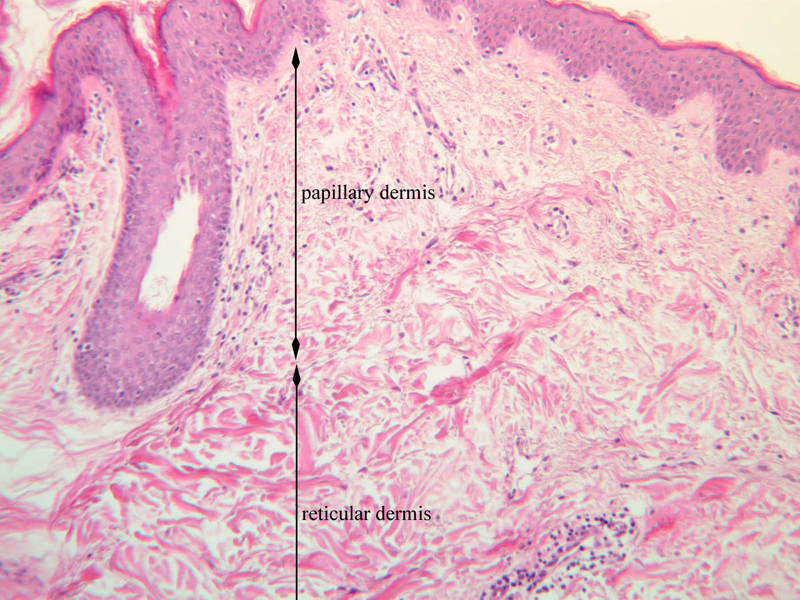 Epidermal ridges project into the dermis, enclosing between them the highly vascular dermal papillae. 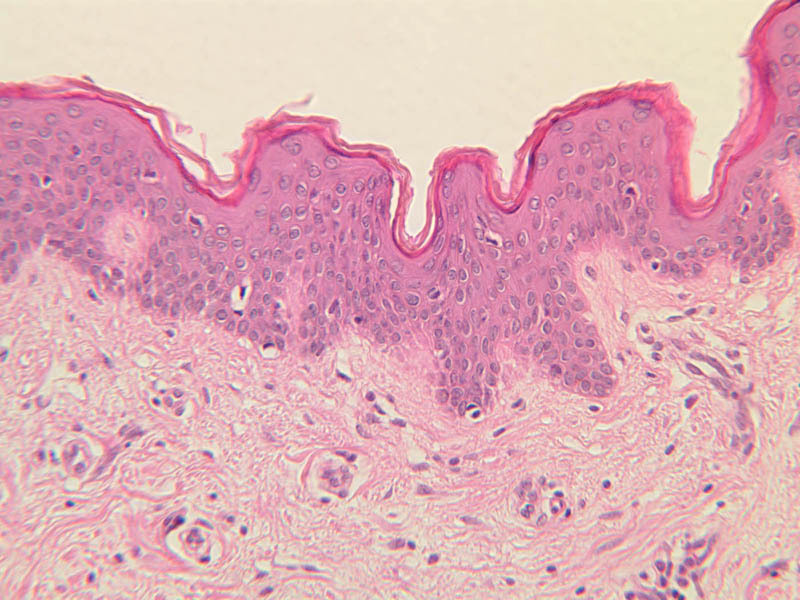 Beneath the dermis lies the subcutaneous tissue, a loose layer of connective tissue, fat, blood vessels, and nerves. The skin appendages are situated partially in the dermis and partially in the subcutaneous layer. 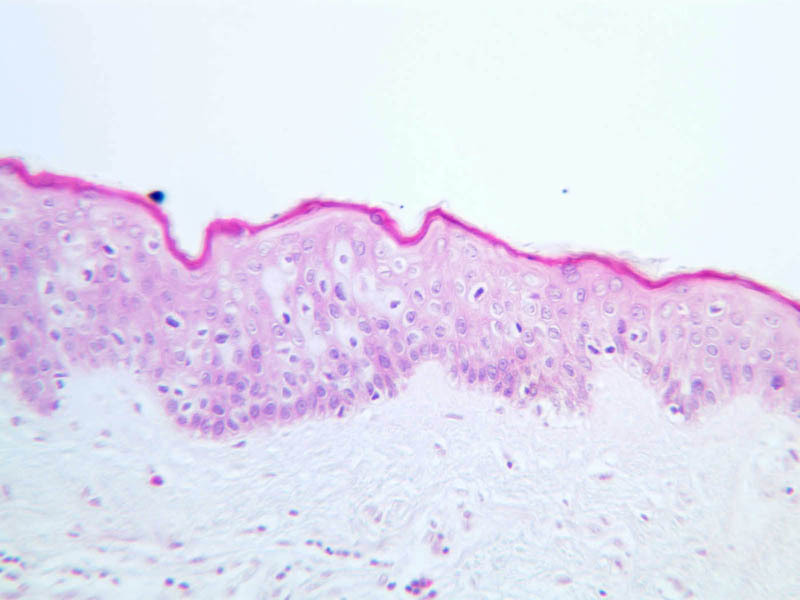 The skin consists primarily of two cell types; a keratin-producing epithelial cell (keratinocytes) and a pigment cell of neural crest origin (melanocyte). Langerhans cells are also present. These are believed to be antigen presenting cells of the epidermis. 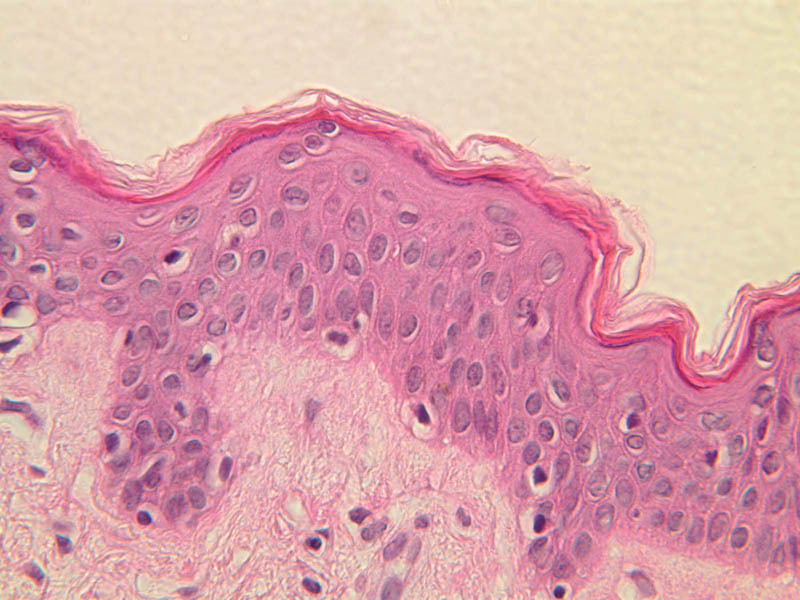 The keratinocytes exhibit morphological and functional stratification from base to surface of the epithelium and thus provide a basis for distinguishing several layers of the epidermis. Examine slide A-50 (fingertip, H&E [2.5x, 10x-labeled, 20x, 40x-labeled] [20x, 40x] [10x, 20x, 40x] [20x, 20x, 40x]), and study the morphology of five layers of thick skin. 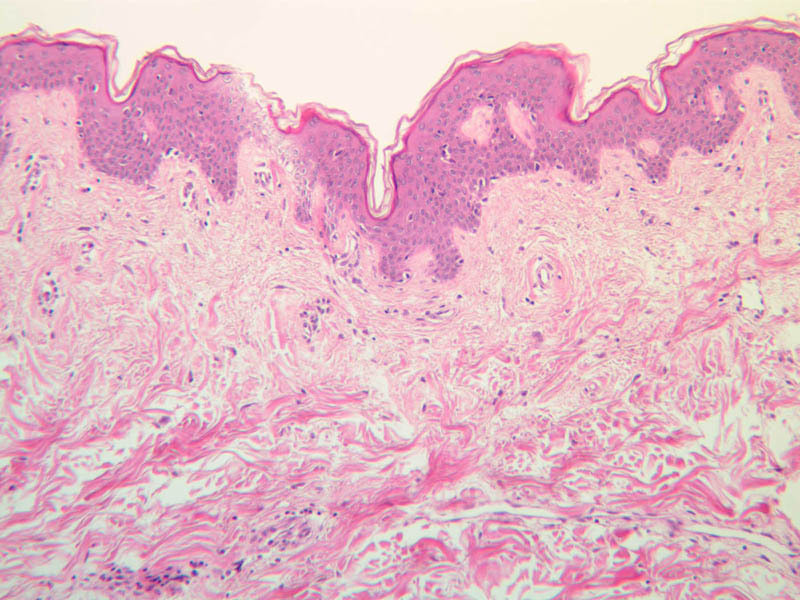 The deepest part of the epidermis comprises the stratum basale which provides the cells required for continual renewal of the epidermis. 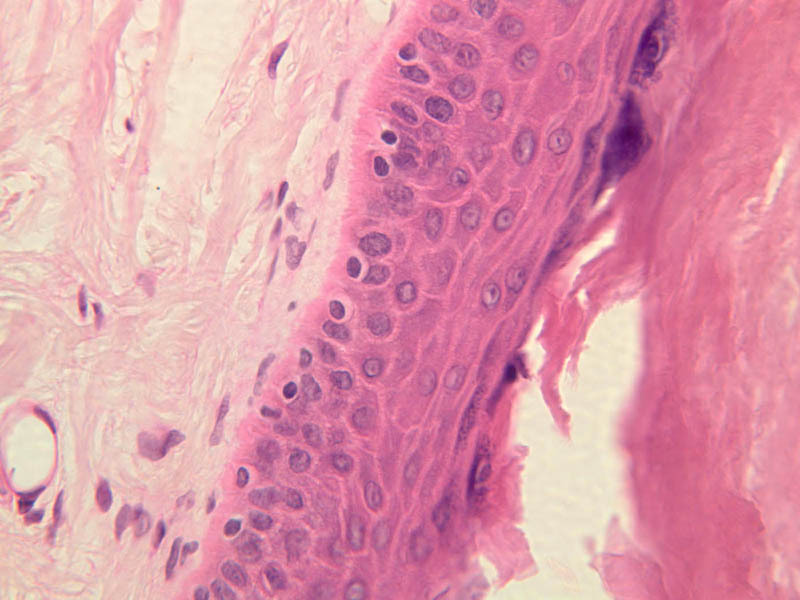 This stratum is composed of a single layer of columnar or cuboidal epithelial cells attached to the basement membrane. Superficial to the stratum basale is a multi-cellular layer known as the stratum spinosum, consisting of polyhedral cells that have a "prickly" or spiny appearance (A-50, langerhans cells [10x, 20x-labeled, 40x-labeled] [40x, 40x-labeled, 40x, 40x-labeled]; A- 48, abdominal skin, H&E [10x, 20x, 40x] [40x, 40x, 40x, 40x]). The spiny cells are separated by intercellular spaces that are bridged at numerous points by cytoplasmic processes, which in turn are bound together by desmosomes. The cytoplasmic processes projecting on all sides from the cells give them the spiny appearance to which the name refers. These are best seen under high power. 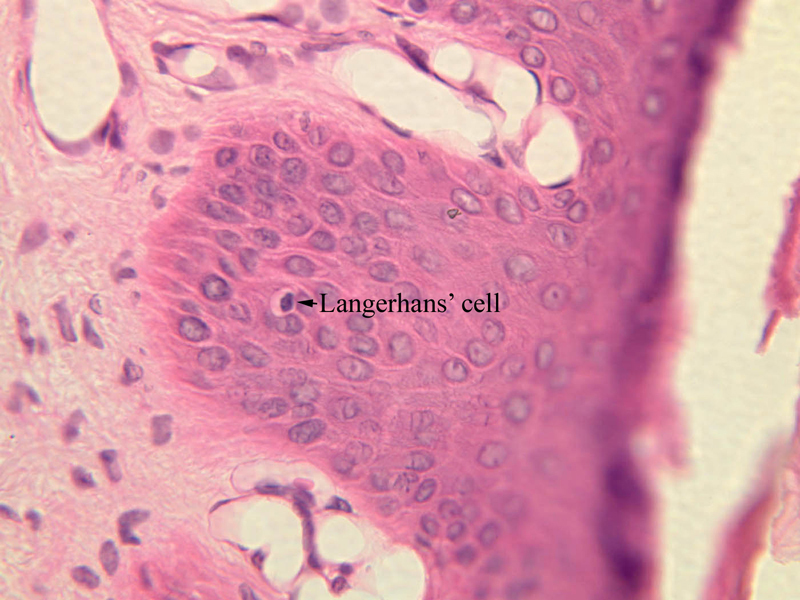 Langerhans cells can also be found in this layer. Superficial to the stratum spinosum is a layer of flattened cells with coarse, deeply-stained cytoplasmic granules, the stratum granulosum (slide A-50 [40x] [40x, 40x] [40x-labeled, 40x, 40x]). 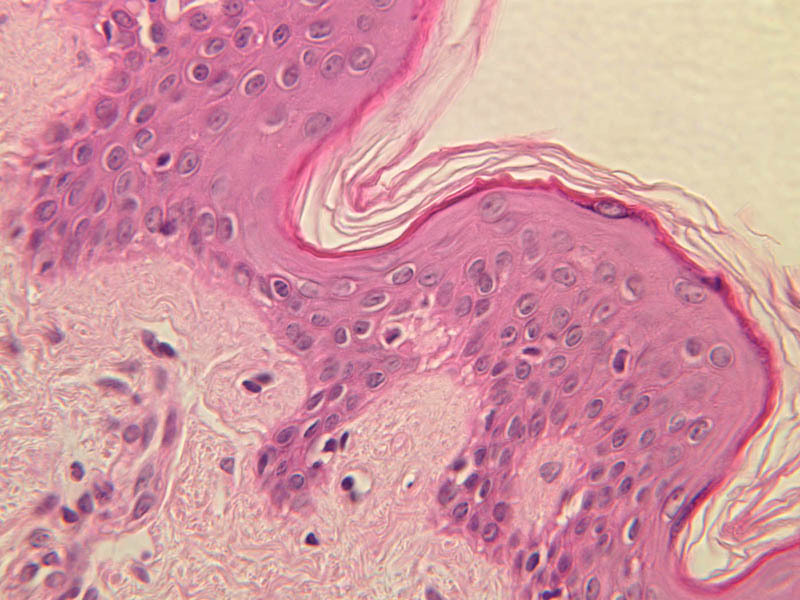 These are keratohyalin granules and evidently represent a stage in the keratinization of the epidermal cells. 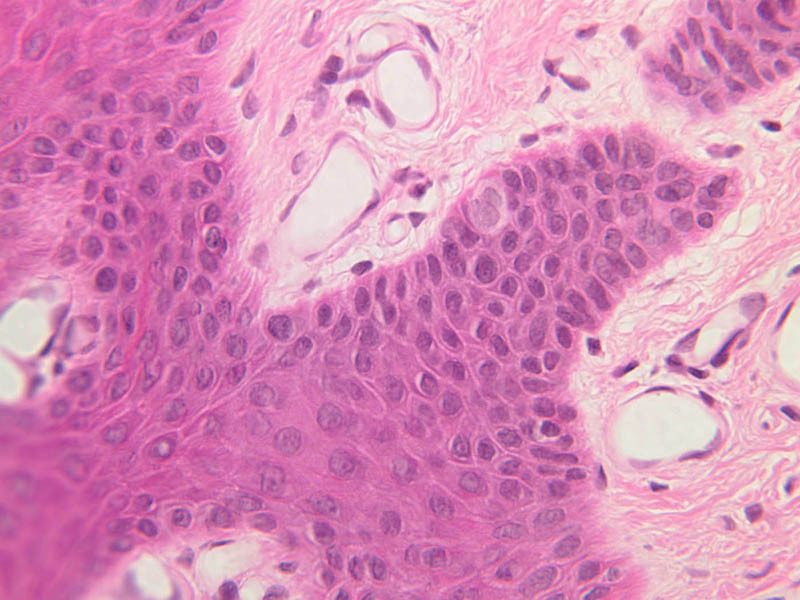 Note that the nuclei of the more superficial granular cells appear dense and pyknotic, foreshadowing their disintegration and the resultant death of the cells. The stratum lucidum is often considered to be a subdivision of the stratum corneum. This layer is evident only in thick (glaborous) skin. It appears as a clear band beneath the stratum corneum. 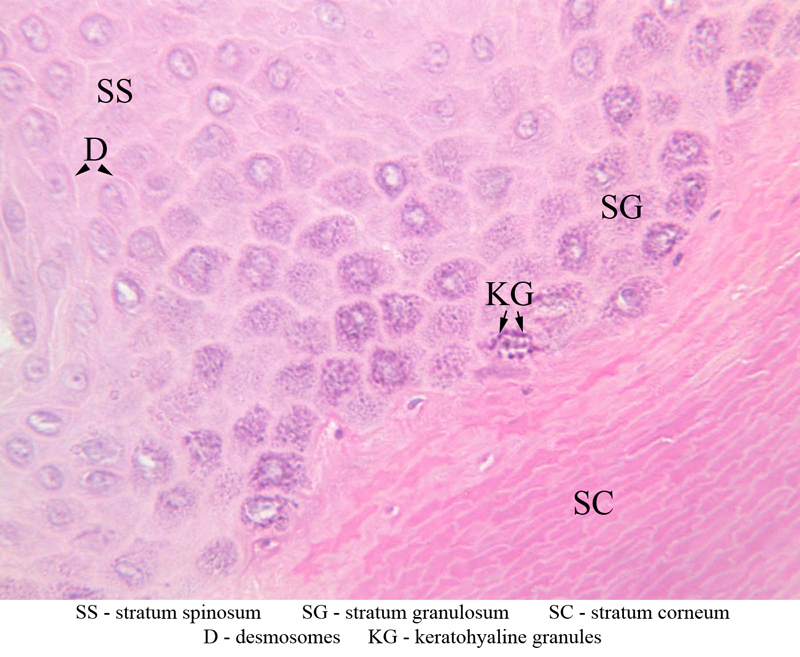 Cells of the stratum lucidum are well advanced in the process of keratinization. Consequently, the nucleus and many of the cytoplasmic organelles become disrupted and disappear as the cells become filled with the intracellular protein keratin. In many specimens, there is a separation artifact at this point. 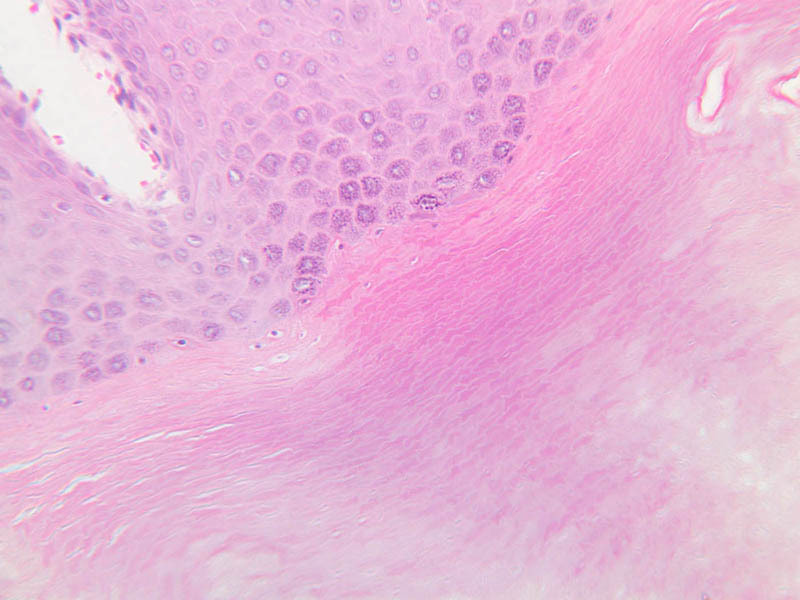 The outermost layer of the epidermis is called the stratum corneum and is composed of fully cornified (keratinized) remnants of epithelial cells ([40x]). It has a basketweave appearance. The close union of the resulting scales with each other, and their content of insoluble protein and extracellular lipids, provides a barrier to diffusion between the body and its external environment. 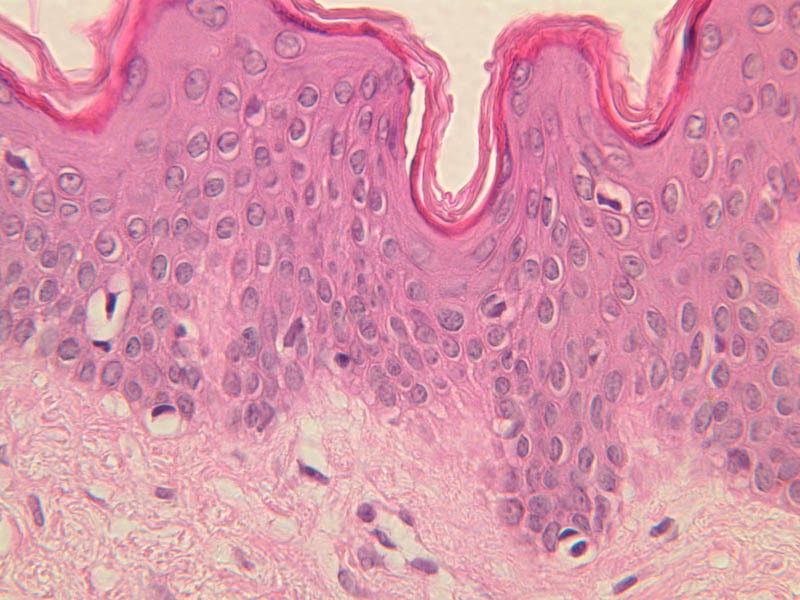 Observe thin skin (slide A-49 [2.5x, 10x, 20x, 40x]). 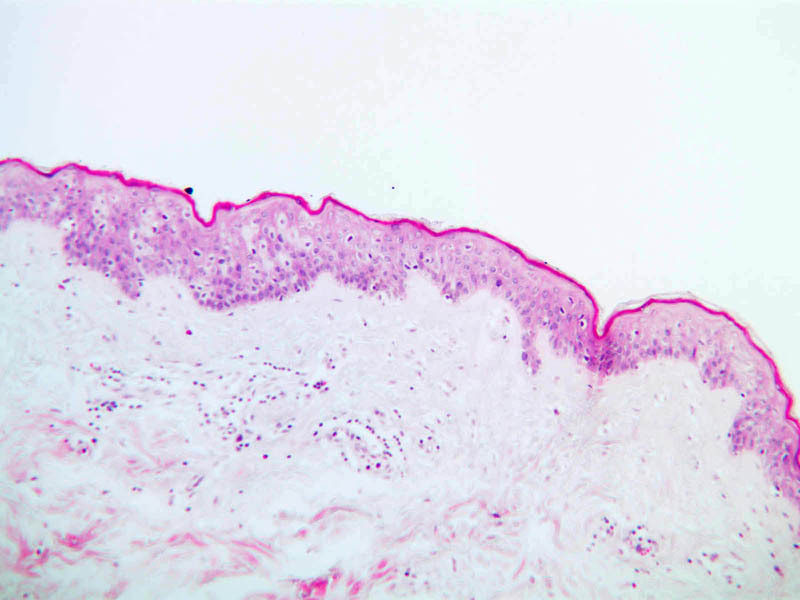 All the epidermal layers in this skin are thin, the stratum lucidum is not apparent and the stratum corneum is especially thin. 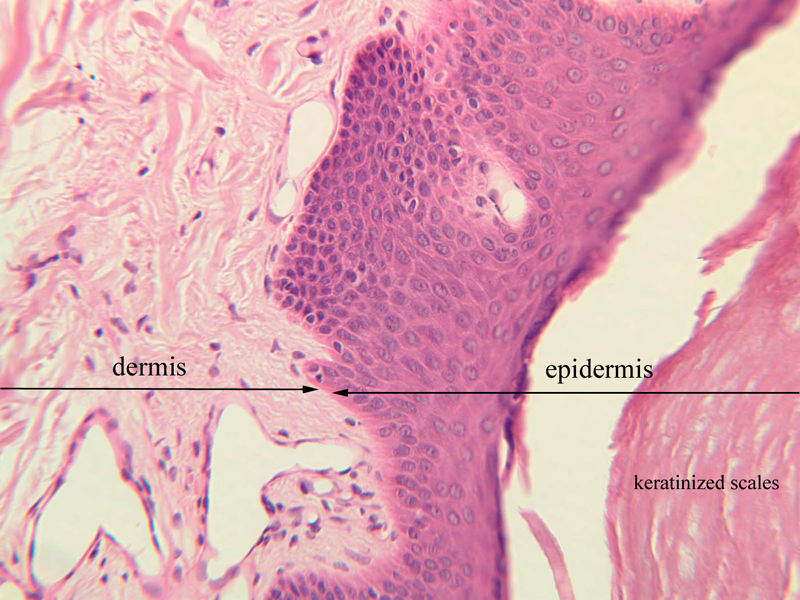 Skin is actually much more variable over the body surface than study of two samples might suggest, but thick and thin skin show the dramatic epidermal differences most commonly seen. Skin color is the result of the combination of colors given off by various pigmented substances present in skin, such as the bluish-red of hemoglobins, the yellow carotenes, and the brownish-black of melanin. Melanin occurs in a protein body, the melanosome, formed by melanocytes. 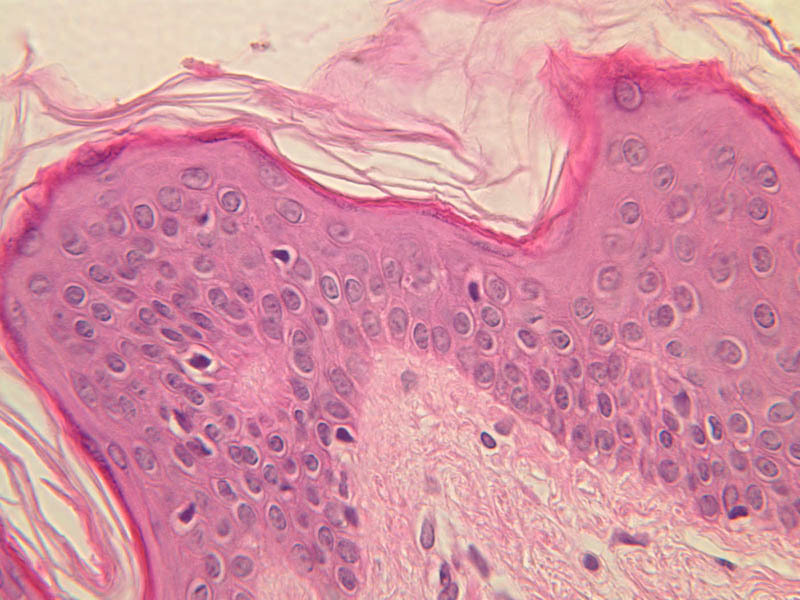 These cells are located in the stratum basale of the epidermis. 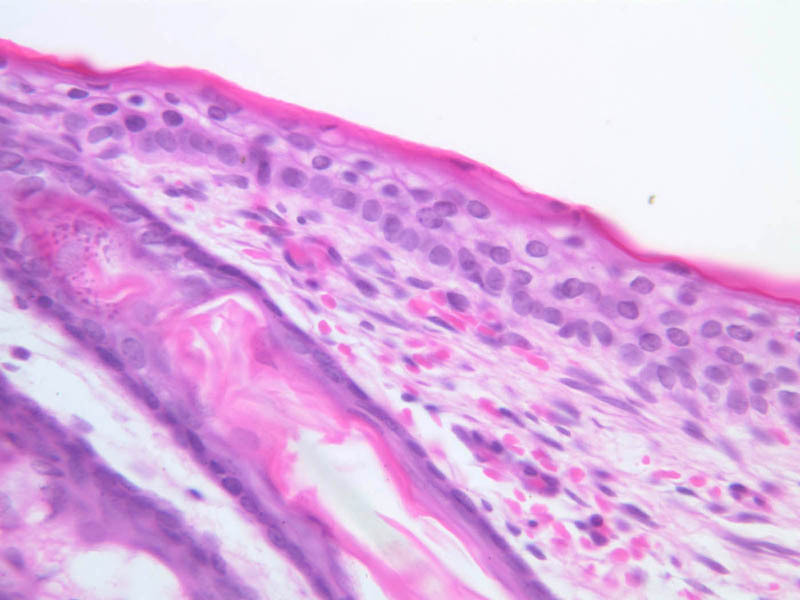 They transfer their melanosomes to the keratin-producing cells of the basal layer of the epidermis by injection. 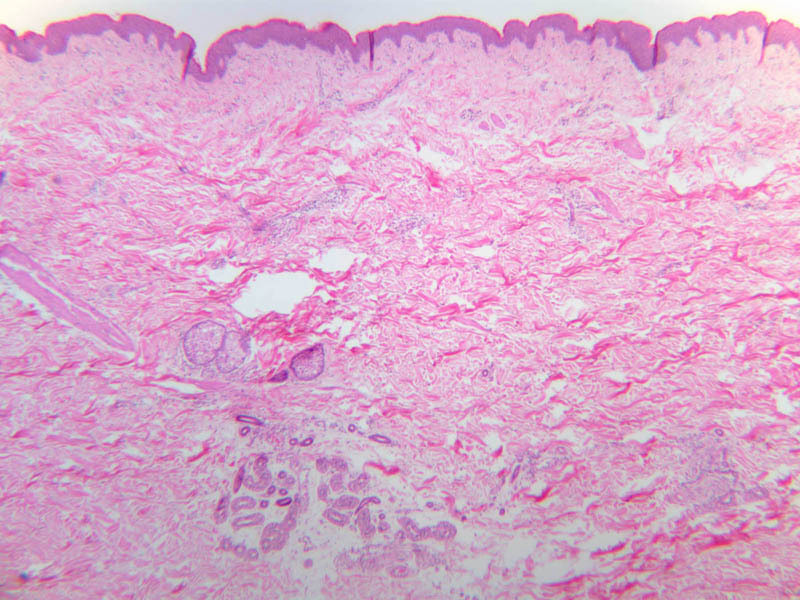 Examine the basal epidermal layer of slide A-48 which was prepared from a dark-skinned person and note the melanosomes in the cytoplasm of these cells ([10x, 20x, 40x] [10x, 20x, 40x-labeled] [40x]). 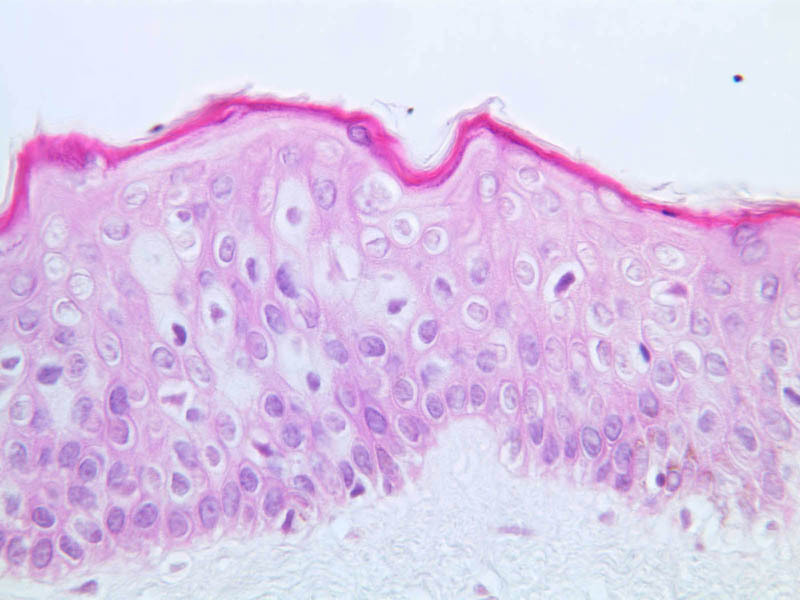 Clear cells occurring among the basal epidermal cells may represent melanocytes that have transferred their pigment granules to the epidermal cells. 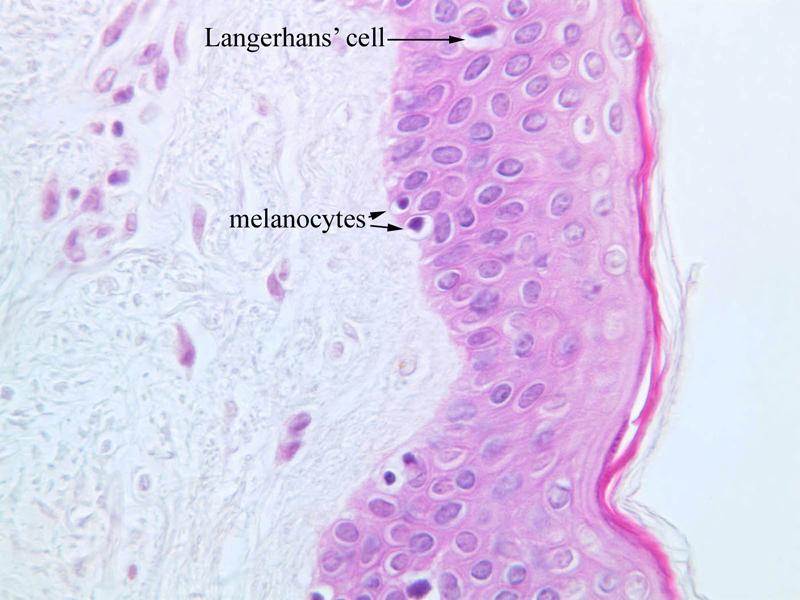 Superficially similar clear cells lying in the upper spiny cell or granular cell layers might represent Langerhans cells, which are unrelated to melanocytes according to current evidence. Langerhans cells serve an immunologic function. They cannot be identified using routine H & E stains. 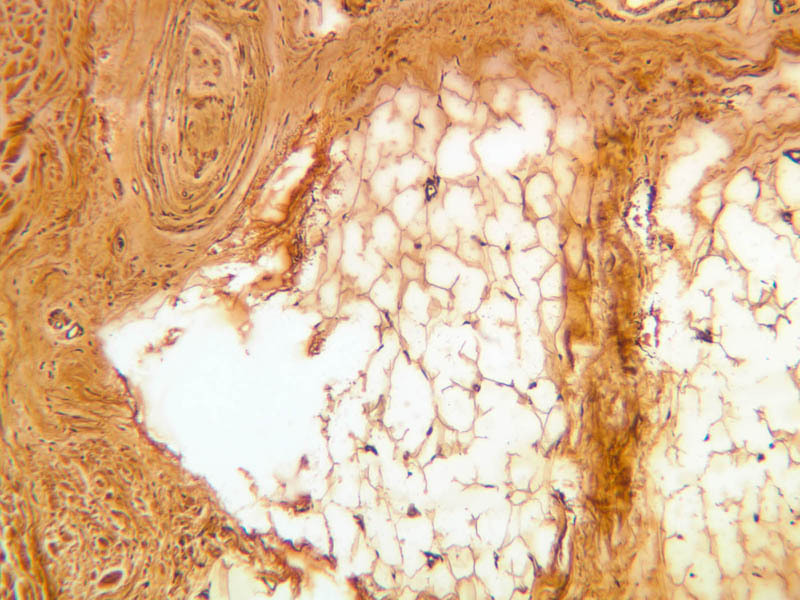 They are readily apparent using immunohistochemistry with antibodies to their surface proteins. 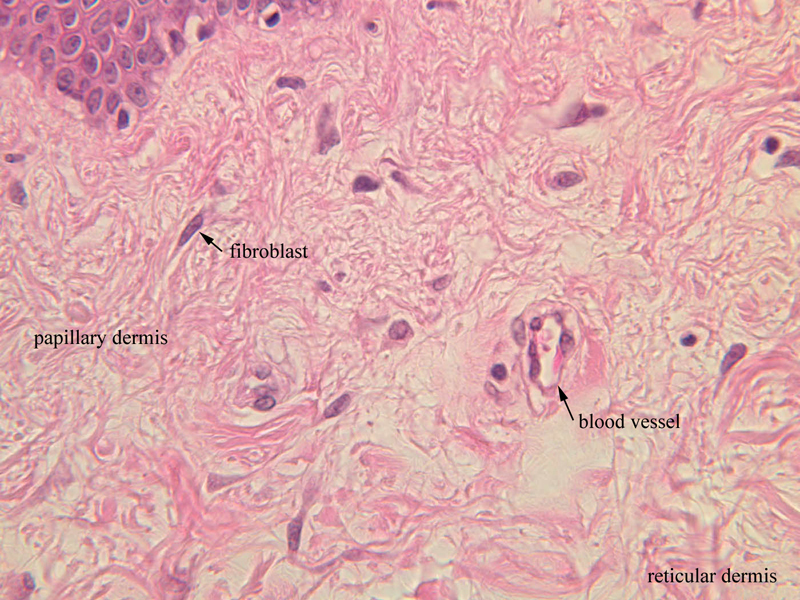 The dermis (glands, nerves, blood vessels, collagen, elastic fibers, ground substance-hyaluronic acid and mucopolysaccharides, fibroblasts, macrophages) of the skin is composed of connective tissue beneath the epidermis, and can be divided into two parts, a papillary layer and a reticular layer (A-48 [2.5x, 10x-labeled, 10x]). 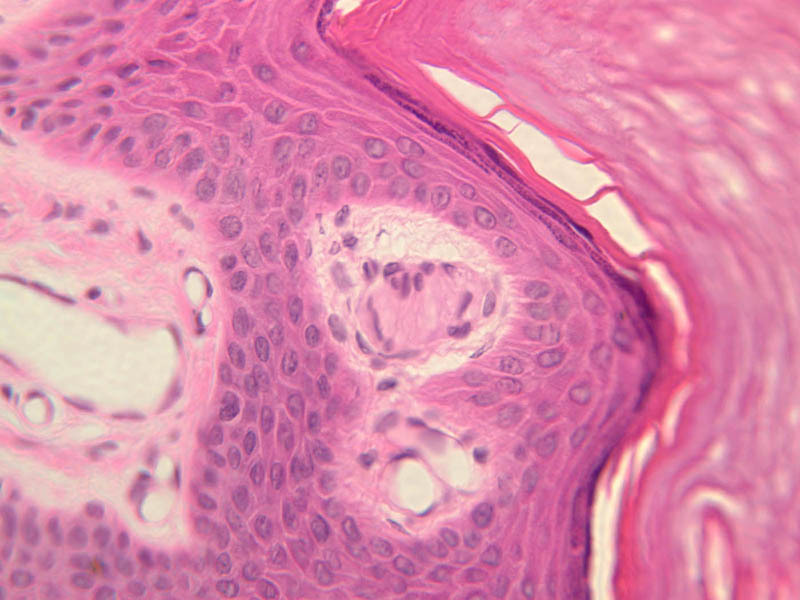 The papillary layer is the more superficial of the two; it projects up into the epidermis. 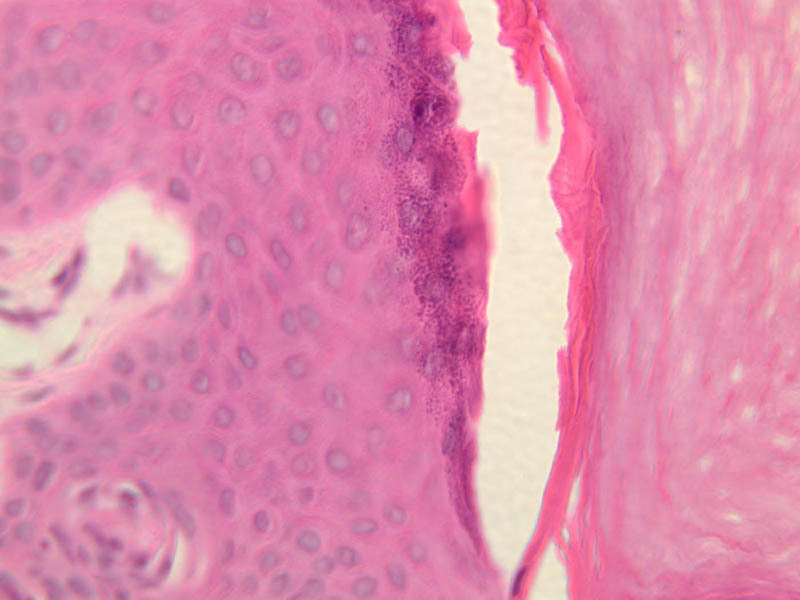 The boundary between the papillary layer and the reticular layer is not distinct. 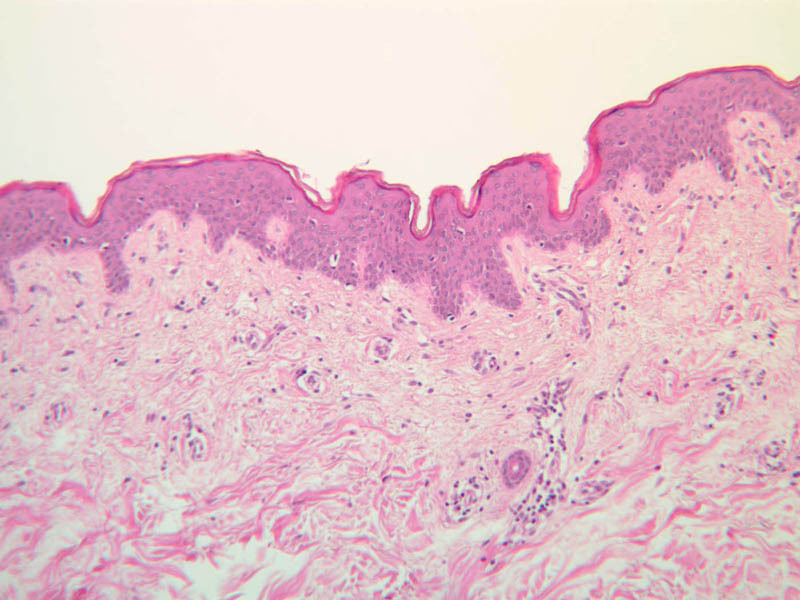 Examine and compare the dermis in slides A-48 ([2.5x, 10x, 20x, 40x-labeled] [10x-labeled]) and A-50 ([2.5x, 10x, 20x]). 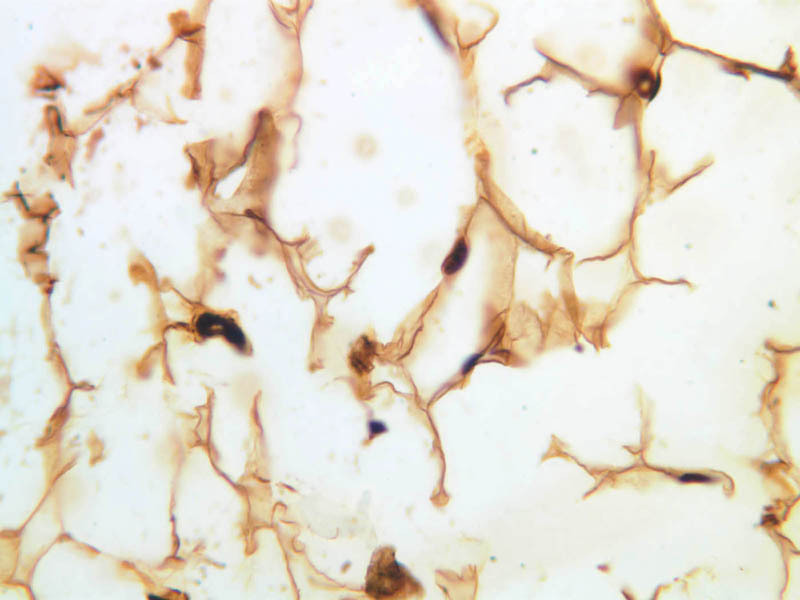 Locate glands, nerves, blood vessels, collagen, elastic fibers, ground substance, fibroblasts, and macrophages. The fibers in the papillary layer are much finer than in the reticular layer, where their cross-lacing produces the network from which the name is derived. 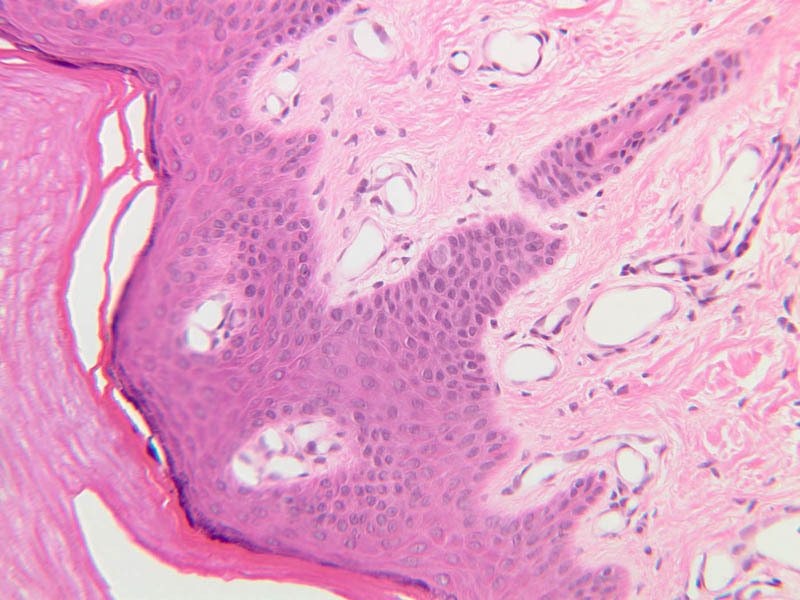 The reticular dermis contains coarse bundles of collagen fibrils. Glands, blood vessels, and nerves can be found here. 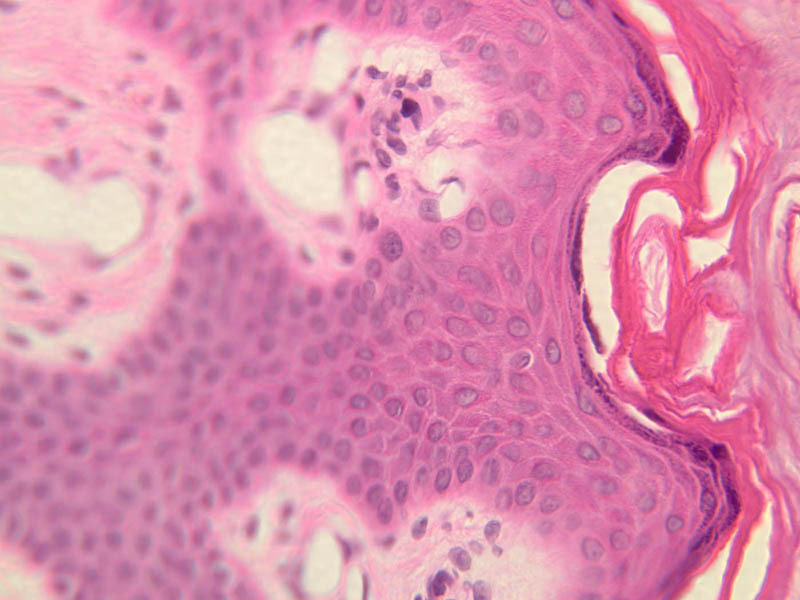 Look at the cell population of the dermis. Besides fibroblasts, it should be possible to find macrophages and several types of cells derived from the blood. 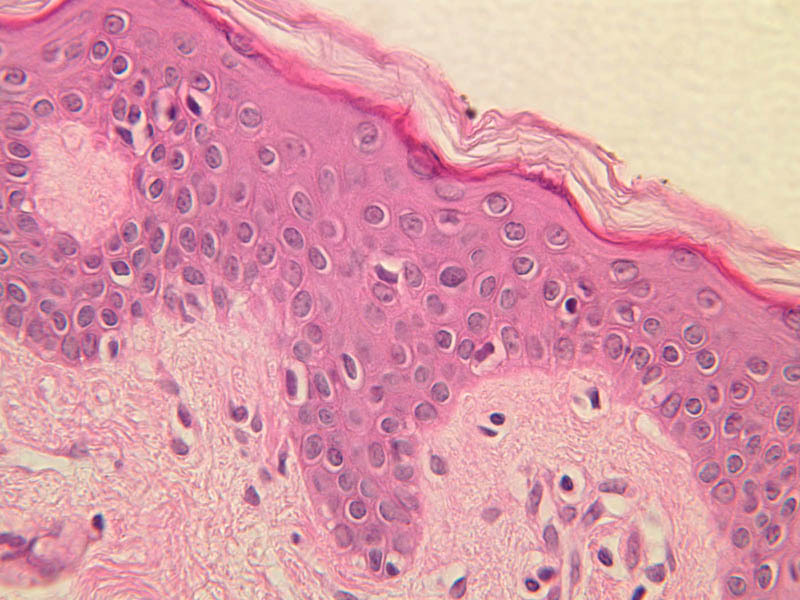 Many of the cells, of course, are part of the skin's defenses against invading organisms. The hypodermis (subcutaneous fat) is located deep to the dermis (A-57, [2.5x-labeled, 10x, 20x, 40x]). 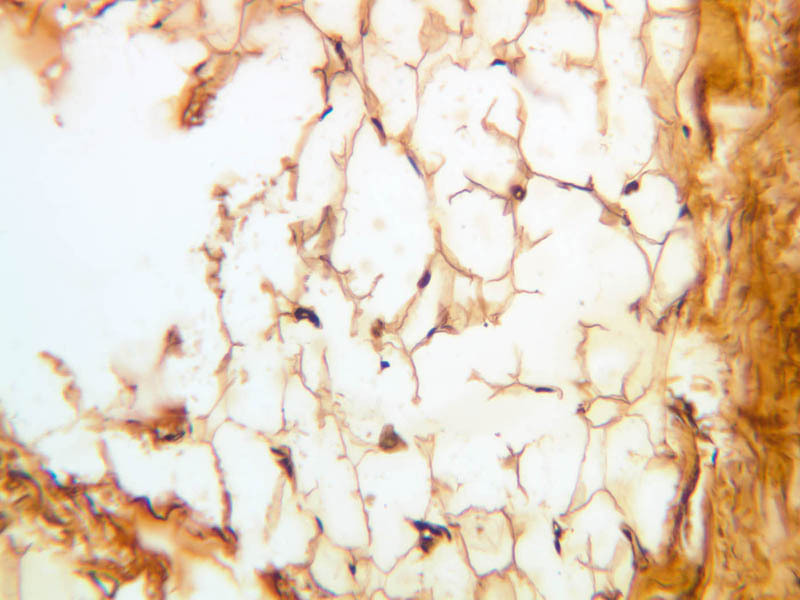 This layer typically consists of loose connective tissue and adipose tissue. In the Gross Anatomy lab, this layer is referred to as the superficial fascia. 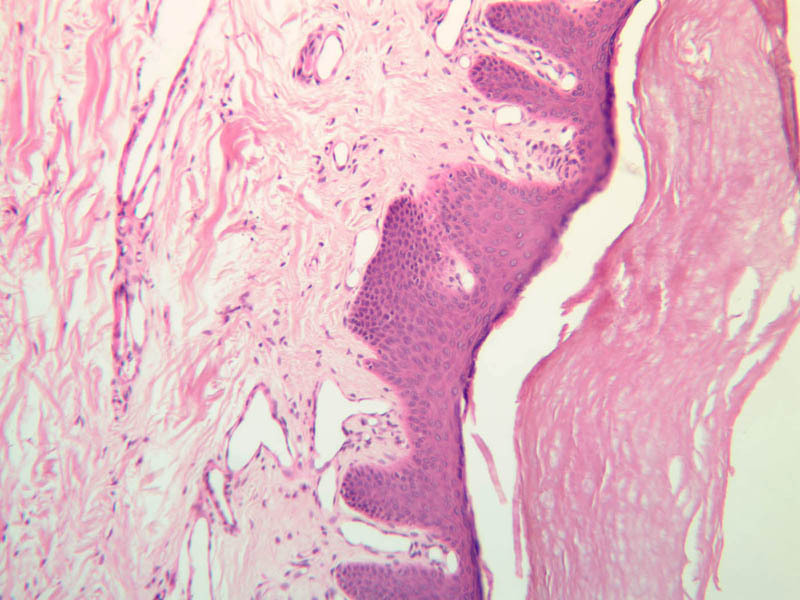 The secretory portion of the gland is located in the reticular layer of the dermis or in the subcutaneous tissue. The secretory cells are shaped like truncated pyramids, with their apical ends surrounding the lumen. 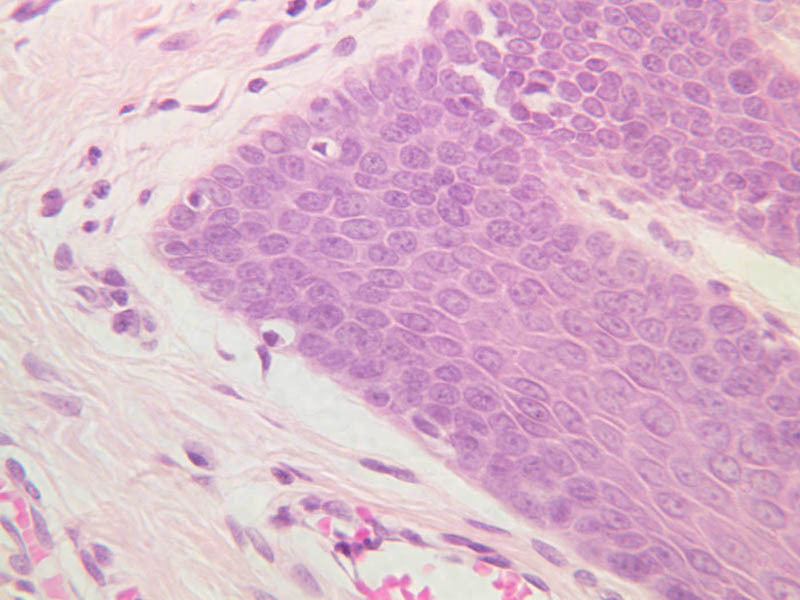 Between the basement membrane and the secretory cells, the nuclei of myoepithelial cells can be seen. By their contraction, these cells help to empty the gland of secretions. Their ducts become coiled as they travel through the dermis. 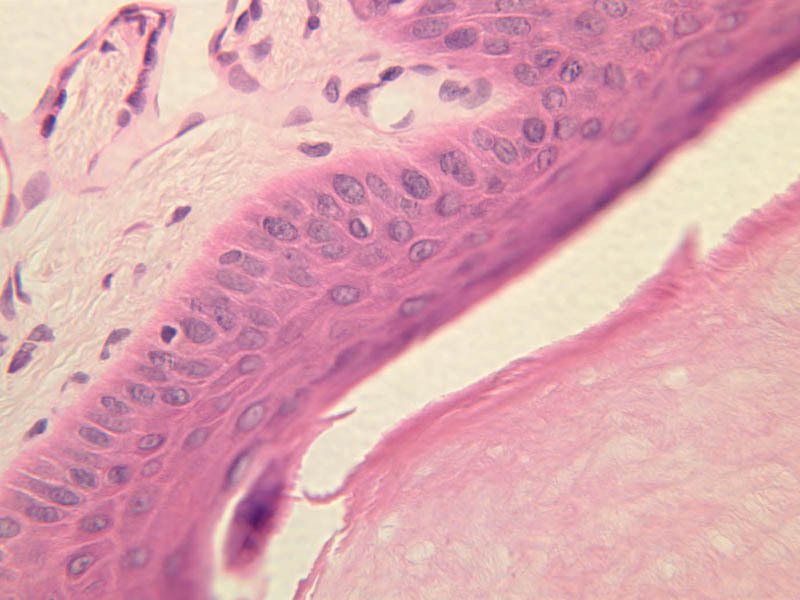 The ducts are composed of a double layer of epithelial cells that usually appear to be more intensely stained than the secretory cells. (slides A-48 [2.5x, 10x] [2.5x, 10x-labeled, 20x, 40x-labeled] [2.5x-labeled]; A-50 [2.5x-labeled, 10x, 10x, 10x, 10x, 10x]; A-58 [2.5x, 10x, 20x-labeled, 40x]; A-55 [2.5x, 10x, 20x] [10x, 10x]; A-52 [10x]; A-59 [10x]). 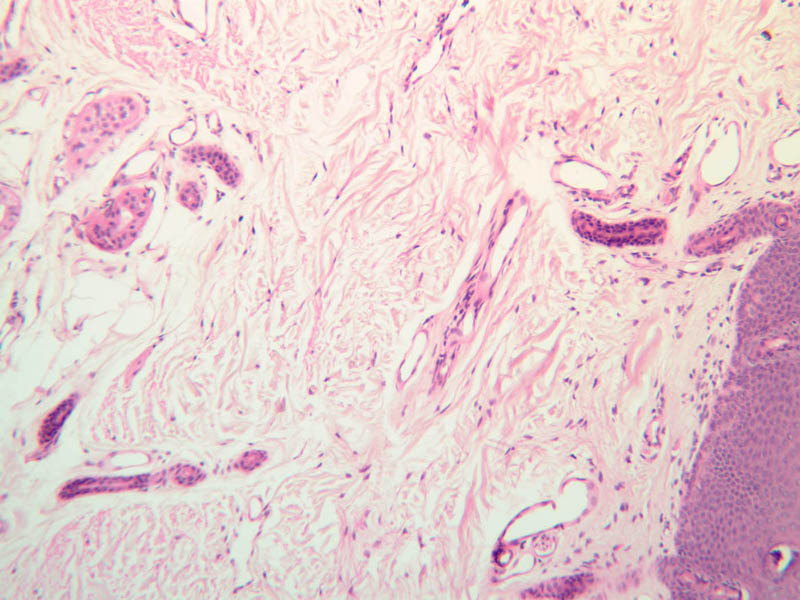 These glands stain relatively darkly, with both eosinophilic and basophilic components. Two populations of secretory cells are described as being present. They are serous in nature, and consist of a small, highly coiled single tube (i.e., simple tubular glands). 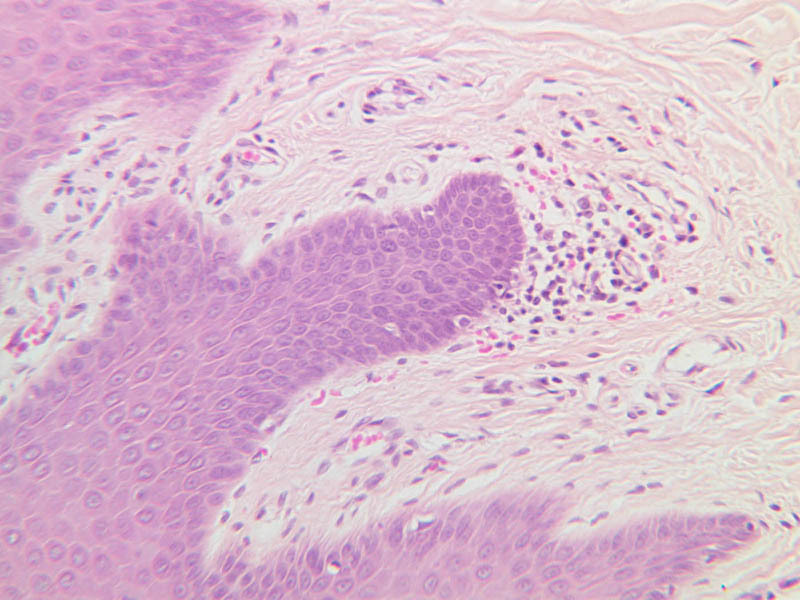 The ducts from the glands are lined with a double layer of stratified cuboidal epithelium. Myoepithelial cells are located at the periphery of the secretory cells. 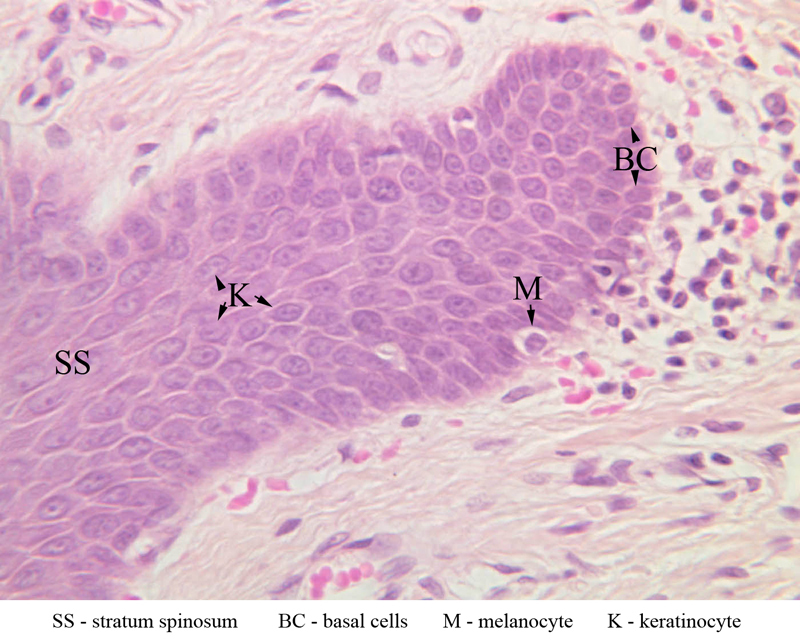 Where are the myoepithelial cells located with respect to the basement membrane? 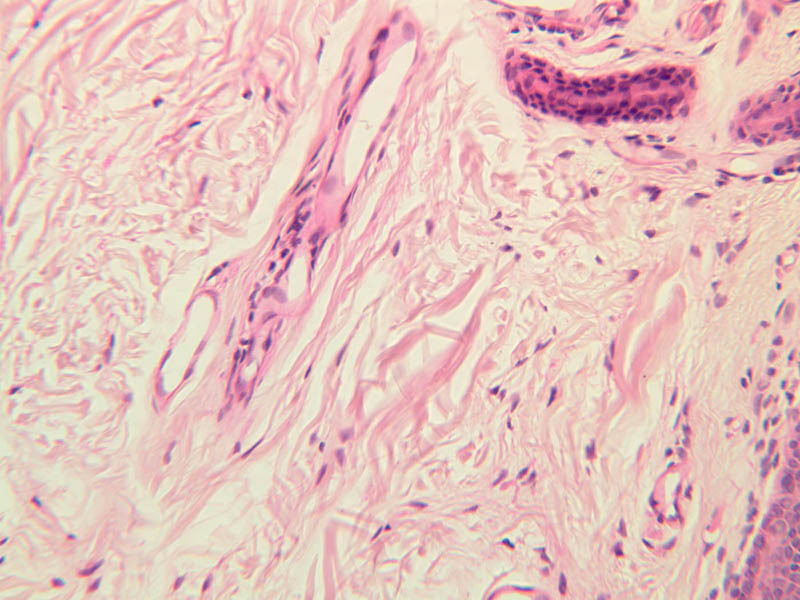 (slide A-58, axilla [2.5x-labeled, 10x, 20x, 40x-labeled] [2.5x, 10x, 20x, 40x] [2.5x, 10x, 20x, 40x]). 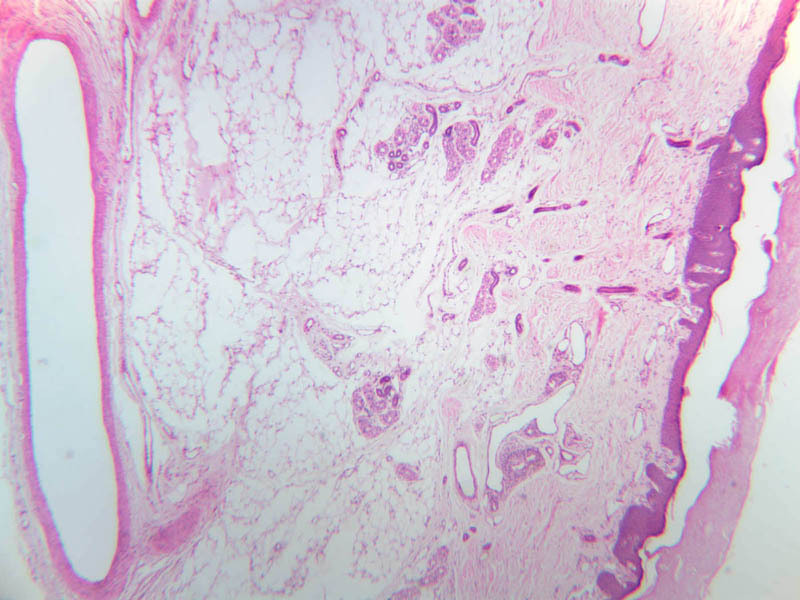 These glands are found predominately in axillary and groin skin and are fewer in number and larger than the eccrine type. They are lined by a uniform population of secretory cells. 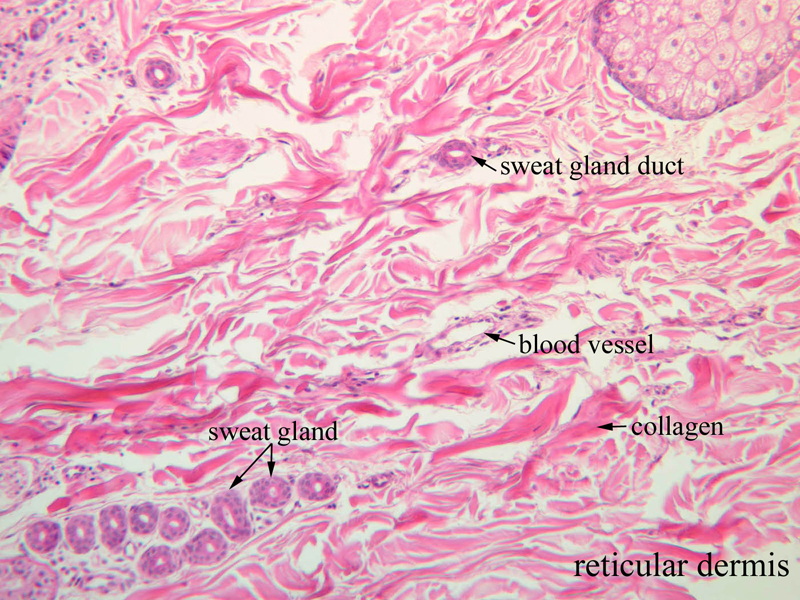 You should identify both types of sweat glands in Slide A-58. These cells undergo apocrine secretion and if you look closely you may see buds coming off the apical cytoplasm of luminal cells. 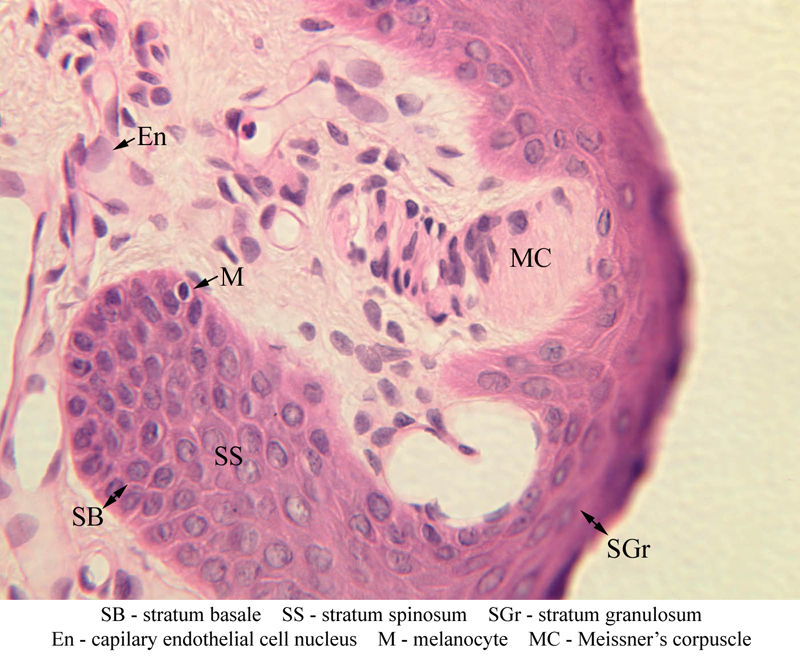 These glands are branched, saccular glands generally associated with hair follicles (slide A-48, abdomen [2.5x, 10x-labeled, 20x, 40x] [2.5x, 10x, 20x, 40x] [2.5x, 20x, 40x]). 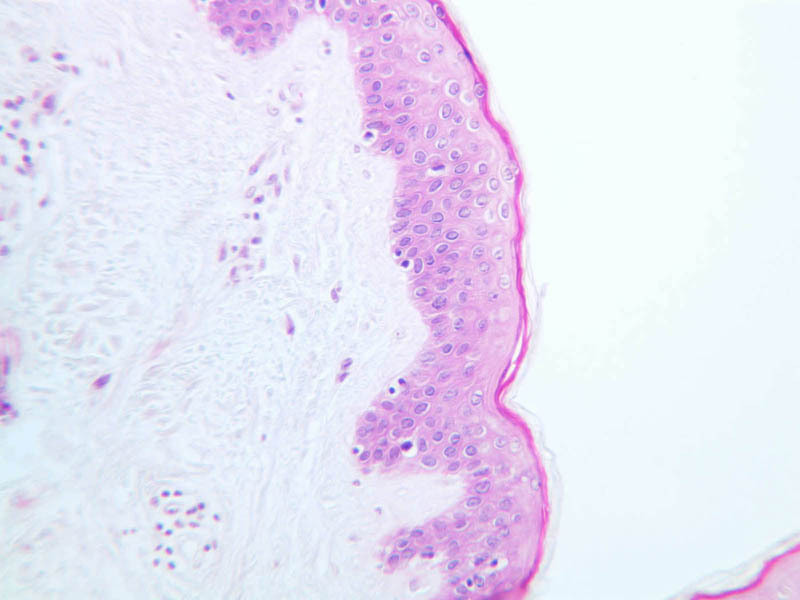 They can be seen on the skin side of the lip (slide A-55 [2.5x, 10x]) and in the scalp (A-52 [2.5x, 10x]; A-59 [10x] [2.5x, 10x]). 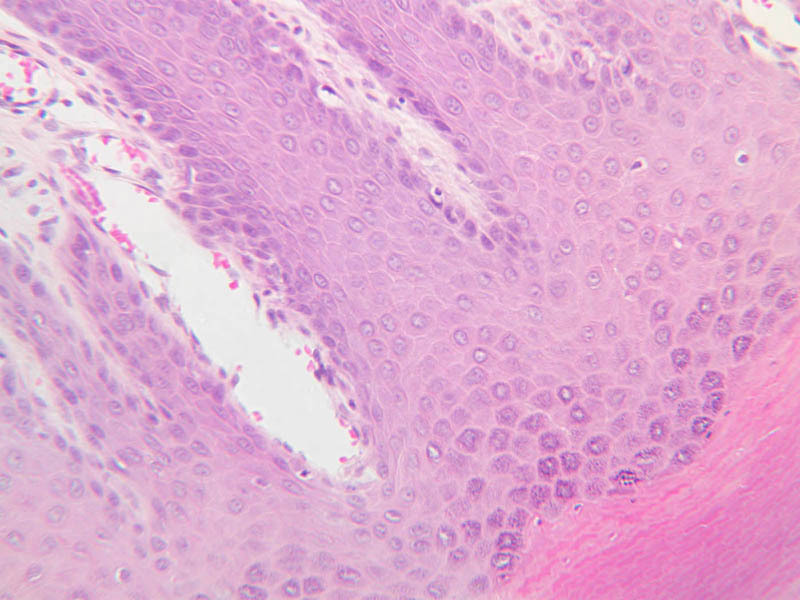 The gland consists of a shell of viable epithelial cells externally which gradually undergo fatty degeneration as they are pushed into the interior of the gland. They finally disintegrate completely and form the fatty substance that makes up sebum. This material leaves the gland through its neck which attaches to a hair follicle. 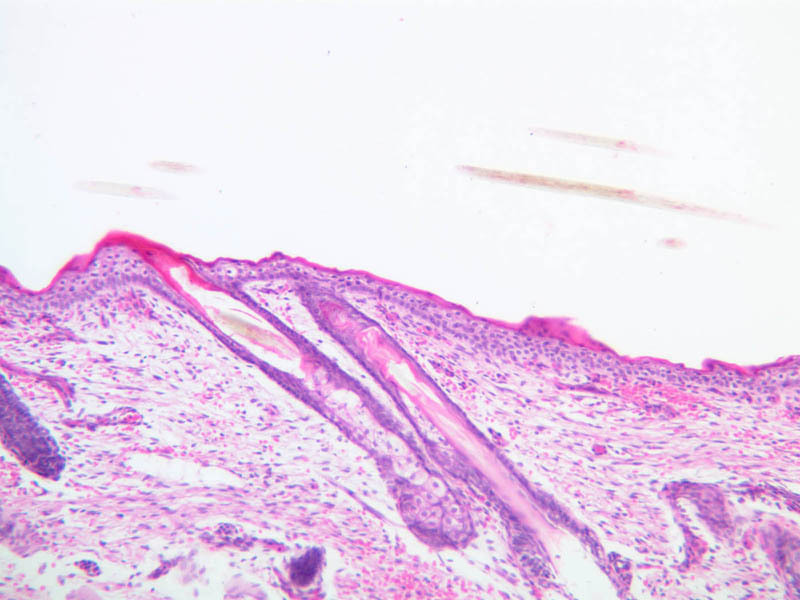 Locate a hair follicle cut in cross section (slide A-49, embryo scalp [2.5x, 10x, 20x, 40x] [2.5x, 10x, 20x-labeled, 40x]; A-59, scalp [2.5x, 10x, 20x, 40x]; A-58, axilla [10x, 20x, 40x-labeled]). It will have the appearance of a series of concentric rings. 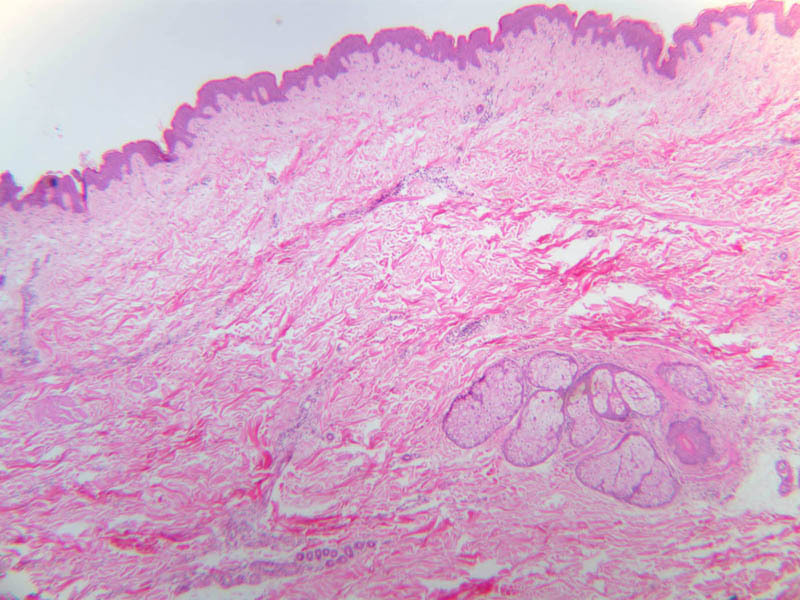 The outermost ring is a layer of condensed connective tissue. 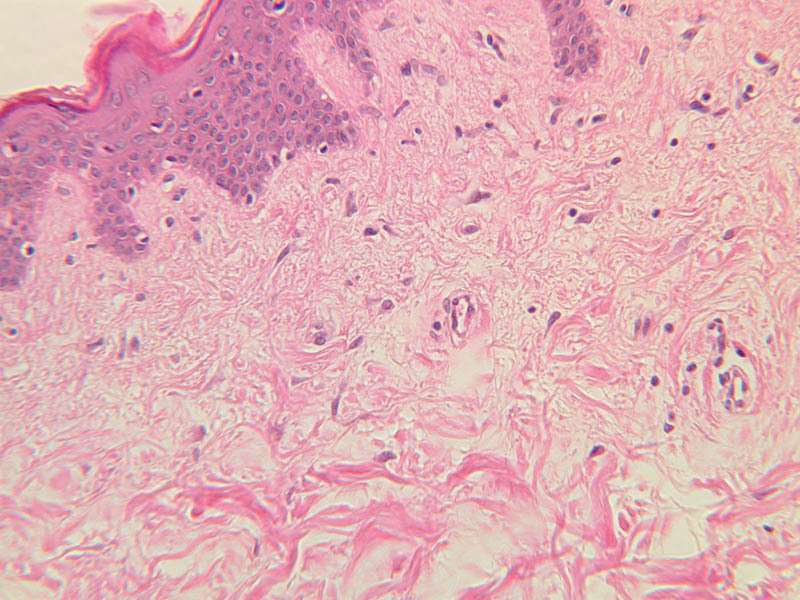 Interior to the connective tissue can be seen the thickened basement membrane of the hair follicle. Inside the basement membrane is the epithelial root sheath. 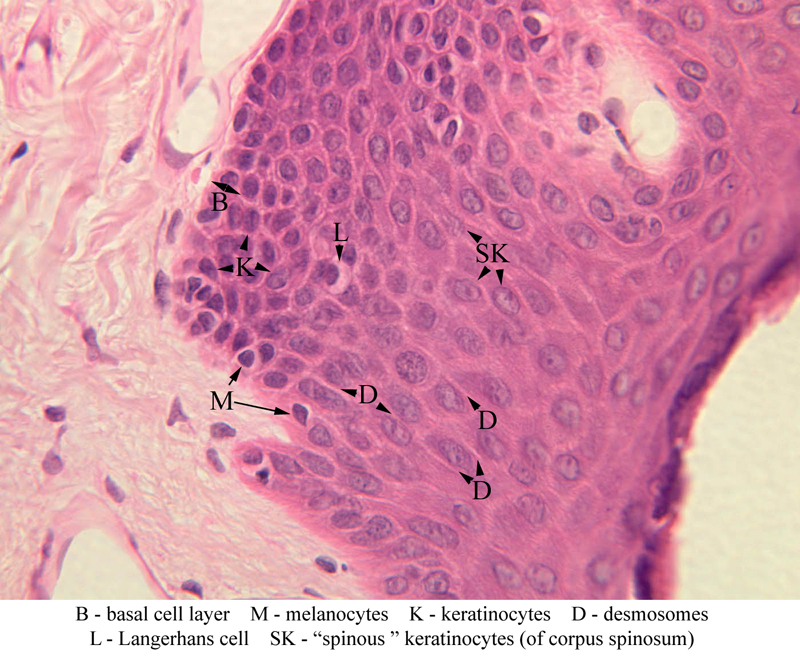 Cells in the outer part of the root sheath are non-keratinized and appear clear; cells of the inner root sheath are keratinized and form a cuticle with cells overlapped downwards. 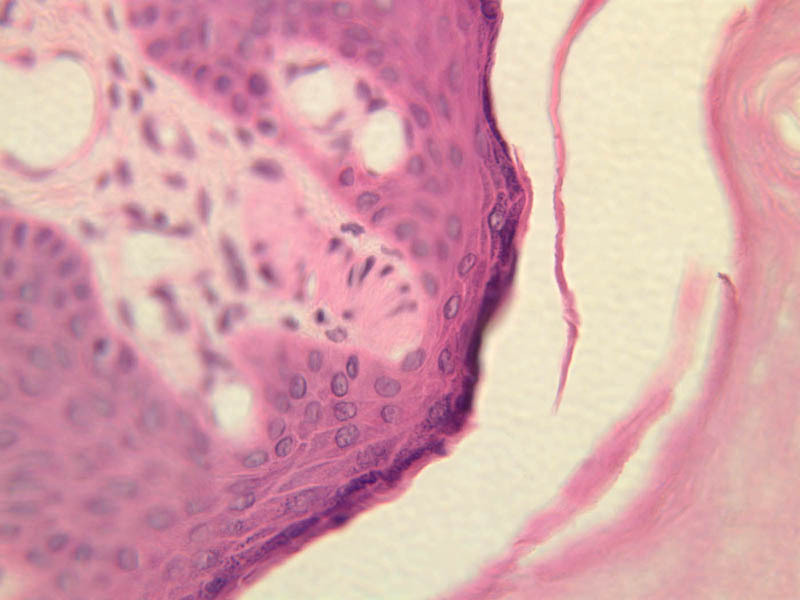 The hair shaft lies inside the epithelial root sheath. 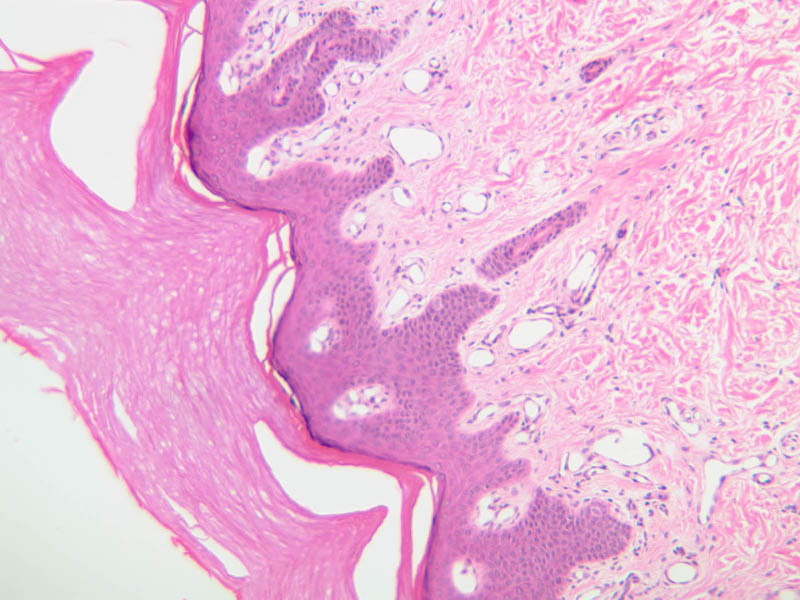 The shaft cuticle consists of keratinized cells which overlap upwards and interdigitate with the follicle cells. Inside the hair cuticle, the cortex of the hair represents the innermost circle. It consists of heavily keratinized, pigmented cells whose individual outlines can no longer be seen. 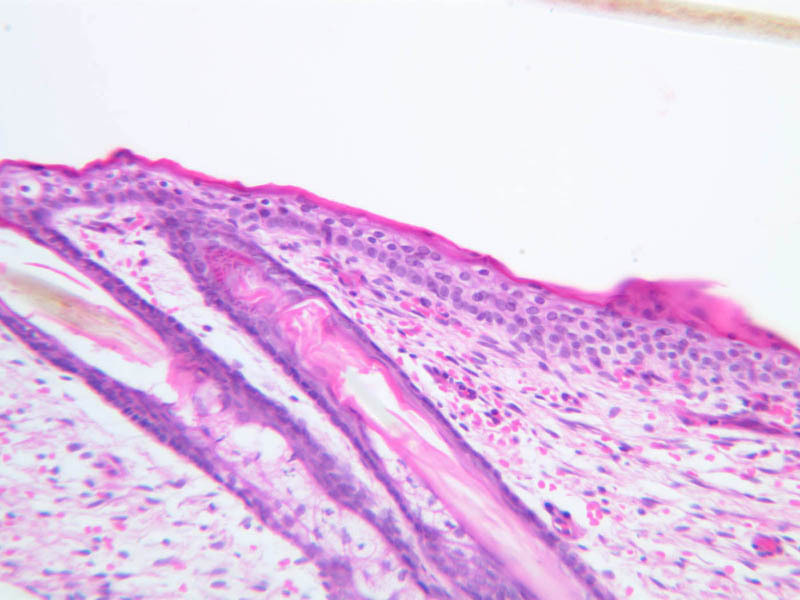 Find a follicle cut longitudinally or obliquely (A-59, scalp [2.5x-labeled, 10x, 20x, 40x, 40x-labeled]). 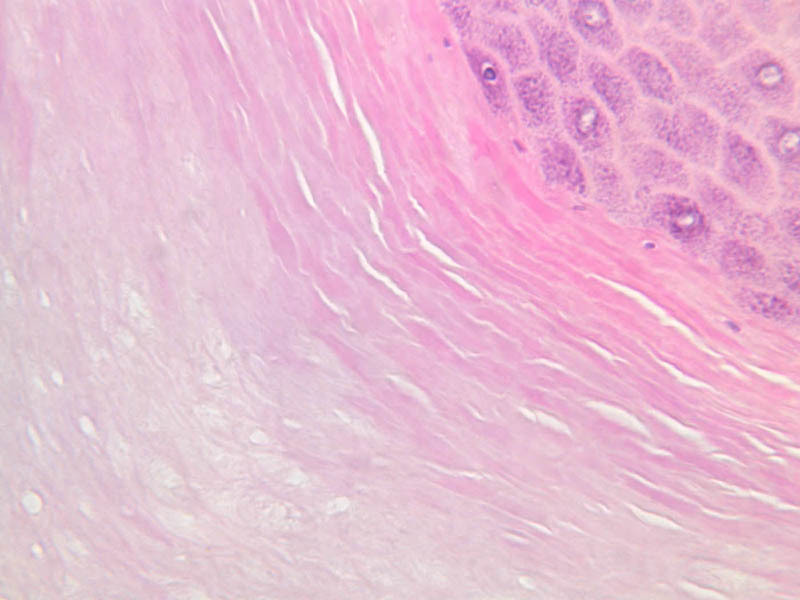 Smooth muscle fibers of the arrector pili muscle are attached to the follicle on the side which forms an obtuse angle with the dermis ([2.5x, 10x-labeled, 20x, 40x] [2.5x, 10x, 20x, 40x]). 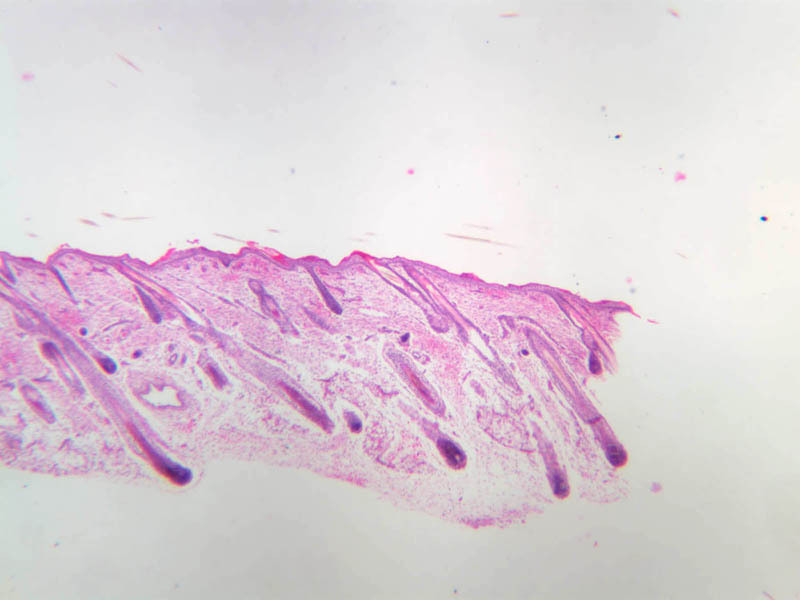 The arrector pili muscles are small, thin, smooth muscles which are diagonally attached to the hair follicle within the dermis and extend to the epidermis. In the angle formed by the muscle and the hair follicle is located the sebaceous gland. These muscles are under autonomic nervous control (sympathetic). 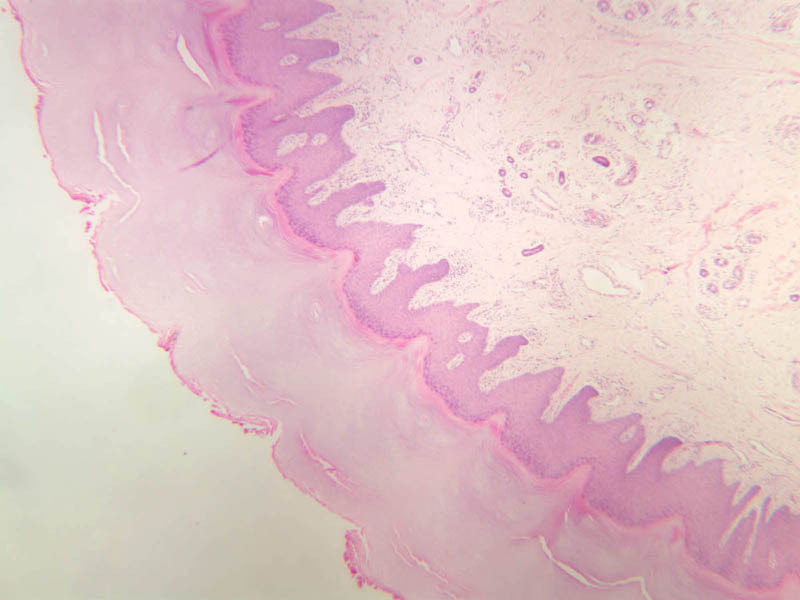 In some dermal papillae that project up into the epidermis can be found examples of Meissner's corpuscles, which are sensory receptors for light touch (slide A-57, fingertip, Sevier Ag [10x, 20x, 40x-labeled] [10x, 20x, 40x]; A-50, fingertip, H&E [2.5x, 10x, 20x, 40x, 40x] [10x, 20x, 40x] [20x, 40x]). The corpuscles tend to have an oval or conical shape. Look for one of these receptors, particularly in hairless skin. 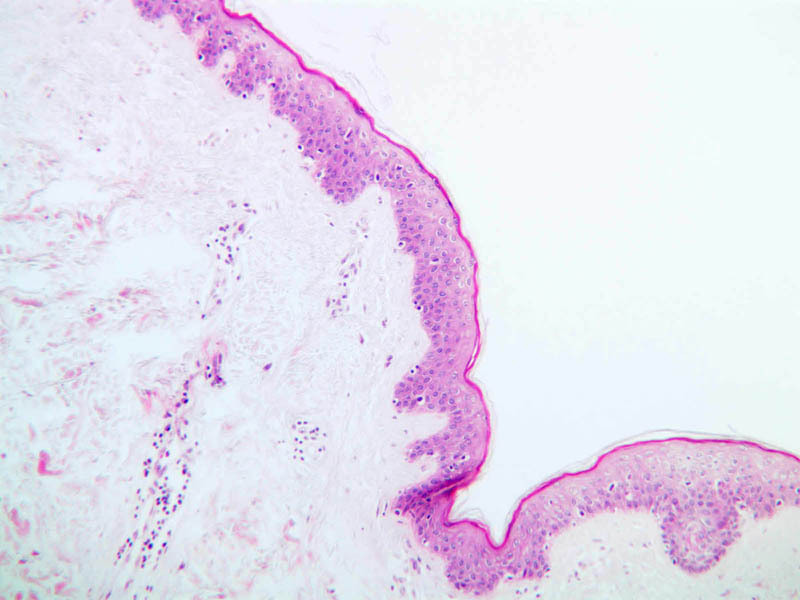 Deep pressure receptors known as Pacinian corpuscles also occur in the skin, as well as other sites (A-57 [2.5x-labeled, 10x, 20x, 40x-labeled] [2.5x, 10x, 20x, 40x-labeled]; A-50 [2.5x, 10x, 20x, 40x]). 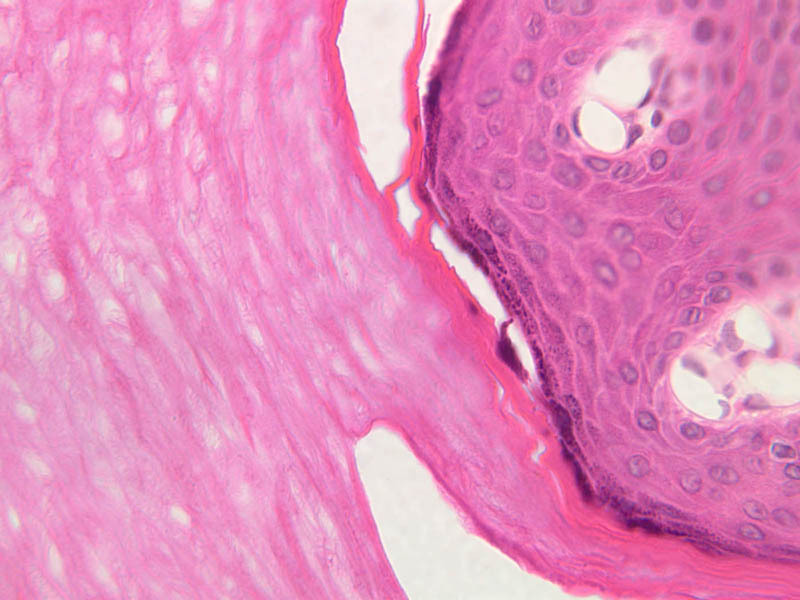 The sectioned appearance of the Pacinian corpuscle resembles a slice of onion, consisting of numerous concentric layers of tissue. 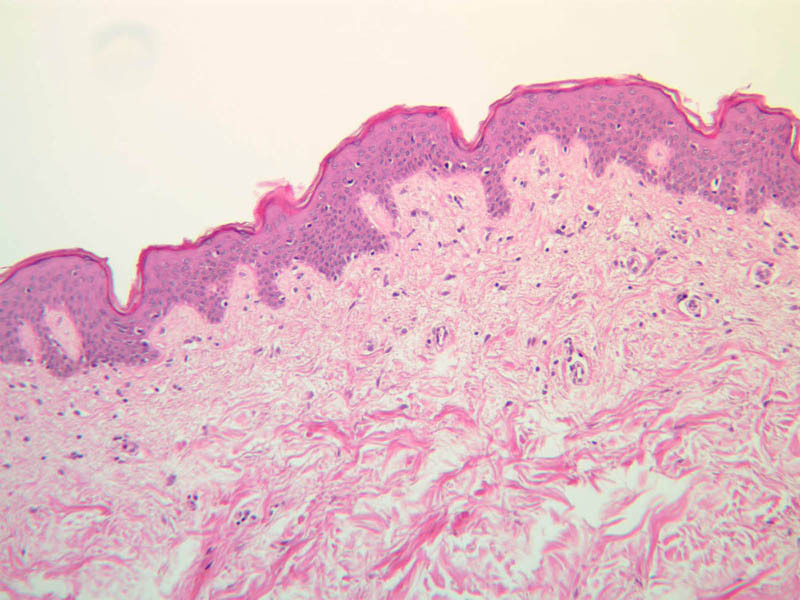 Nerve endings generally thought to be responsible for pain sensation occur as bare fibers within the epithelial layers of skin epidermis, but these are not apparent in routinely stained sections (A-57, fingertip, Sevier Ag [10x, 20x, 40x] [10x, 20x, 40x] [20x, 40x] [20x, 40x]). 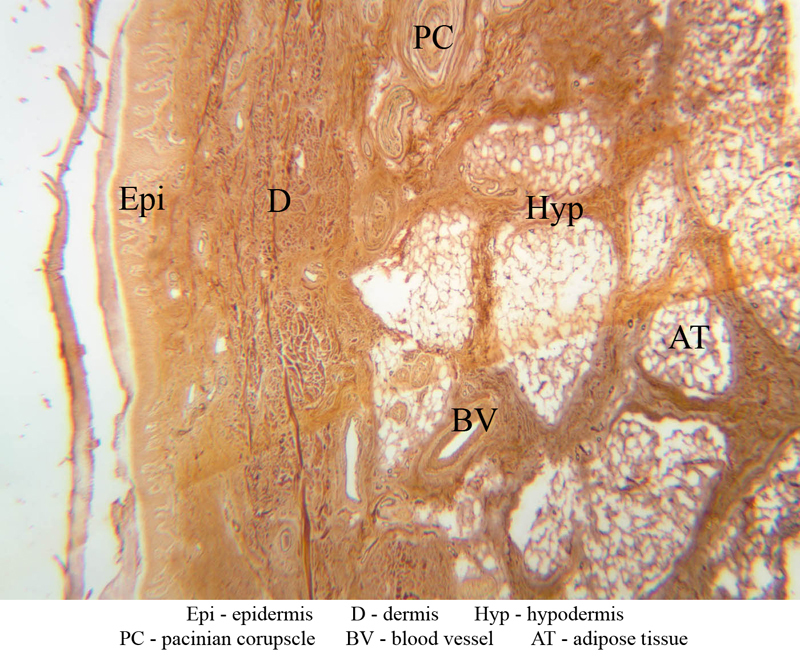 Merkel cells may also be found in the basal layer of the epidermis. These cells are more common in fingertip and lip, and are believed to function as mechanoreceptors to detect pressure. 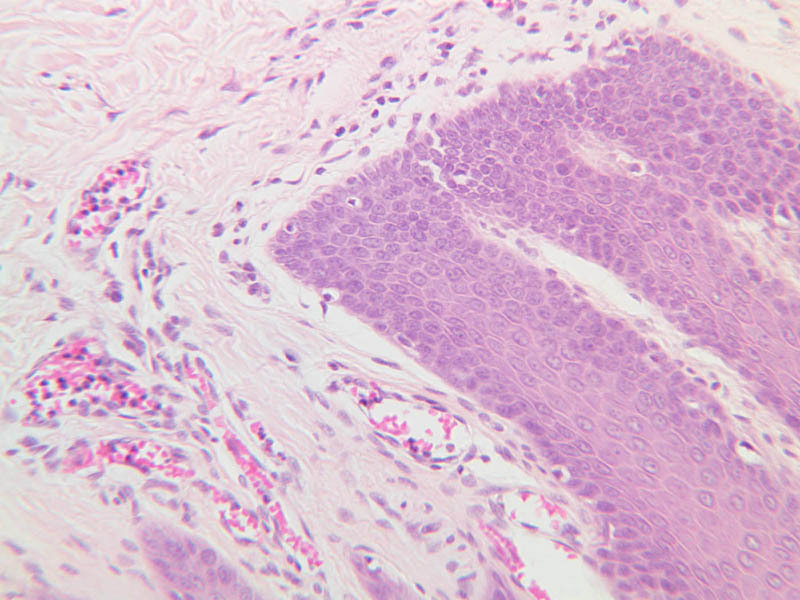 Merkel cells, which are lightly stained by H&E, may be difficult to distinguish from melanocytes without immunostaining. Merkel cells are best visualized by electron microscopy.